Tony Francis pursuing a journalistic career came naturally, as he came from a family of journalists. But what was supposed to be career path turned out to be his passion and it has been a life time job since he started as a rookie at the age of 20 till now, when he will turn 68 on May 22. 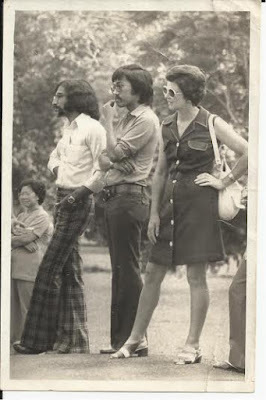 Tony’s elder brothers Jeffery (migrated to Australia) and Jerry (former NST Ipoh bureau chief, retired but still involved in media work) were both working with New Straits Times and he joined them in 1967, as a cadet reporter with the news desk. “Yes, although I was hoping to join the sports desk, I was placed in the news desk where I remained for three months,” recalled Tony. Tony said that besides his brothers being journalists which influenced him in his career, it was legendary sports writer Norman Sibel, who inspired him. “He was a colourful writer, objective, nailed it to the head and called a spade, a spade. “Imagine my joy when I was asked to join the sports desk and Norman was the sports editor. I was going to work under the every person whom I had admired and hero worshiped,” said Tony who joined the late Mansoor Rahman and Ian Pereira at the desk. Tony recalled a day when he asked Norman if he could hitch a ride to a Razak Cup hockey match, he was going to cover. “I just wanted to follow Norman to see first-hand how he did his interviews and what kind of angles he would be looking for. “To my surprise Norman agreed and when we arrived at the Mindef Stadium, I saw a senior hockey official spot Norman and despite several VVIPS present, he immediately rose and rushed towards Norman to greet him and ordered his personnel to get a table and chair for him and pampered over him. Asked Tony if he achieved the status, with another laugh he says: “Norman was a legend. Nobody can attain the standards he had set. I had not even achieved ankle deep of what he had achieved,” said Tony who has been to two Olympics (Korea 1988 and Barcelona 1992) and three World Cups (1974 Germany, 2006 Berlin and 2010 South Africa). Tony rose from a cadet reporter to become Assistant Sports Editor, Sports editor, Chief News Editor and Associate Editor before he retired from NST in 2002 – after 35 years with the organisation. But it was his days with sports that Tony loved and enjoyed for 33 years. Tony was the assistant sports editor with New Straits Times before he become sports editor of The Malay Mail in 2002, before he returned to NST sports desk. Upon retiring, he was the Editor of Golf Digest with Blu Inc before joining Malay Mail under its new management as the editor-in-chief. He now works as a consultant with motoring magazine Top Gear. “In the world of journalism there is no such thing as retiring. If we journalists do not continue working in some capacity, we might die,” said Tony laughing. On working in the news desk despite his love and passion for sports, he had this to say: “Working on the news desk was good. The perks were good. You get to travel to places you never dreamt you would ever go. You get to meet the prime minister and other VIPs and be part of the development process. But it's a restricted environment. “Sports took me on a high like a drug. You get involved emotionally when the country wins or loses. You get so much joy in telling a happy story to your readers or sad when you have to tell them what happened in defeat. Tony said his phase with the Malay Mail sports desk and then back with the sports desk in NST holds fond memories. “I had an excellent team in Malay Mail and I managed change the style of sports writing with commentaries, personality highlights and inside and behind the scene stories. I managed to continue with that when I moved back to NST and it was very satisfying. Tony also recalled is early days in journalism which moulded him to become what he is. Tony recalled an incident in 1969, still as a rookie reporter which shook him up but only made him stronger and be prepared for all sorts of challenges. “It was May 13 and I went to cover a Selangor football league match at the TPCA Stadium (now Jalan Raja Muda Stadium). I was there with Francis who hitched a ride with me on my Honda Sports 90 motorcycle,” recalled Tony. “The match had hardly began when we heard explosions and then smoke billowing. The crowd at the stands rushed to the top of the stands to see what was happening and in a split second were retreating and running helter skelter. The match was still going as the referee refused to stop the match despite people running all over the field. “I too run up to the top of the stands and what I saw shocked me – cars were on fire and people running in all directions. I ran down and told Francis what was happening and we immediately made our way to the main building. The officials immediately locked the main gate ordered us to remain inside the building. We remained there overnight! “But being a reporter, I found a public phone to call back the office to report the situation, give a five para story to the news desk and then called the sports desk and give the abandoned football match report. Tony said that on May 22 on his birthday, when curfew was lifted he had returned to pick his motorcycle at TPCA and all he saw when he arrived was the shell of the motorcycle which set on fire. Tony also recalled personalities whom he had met in his course of job which were just dreams before that. Indonesia’s badminton star Rudy Hartono became a close friend to him after he ghost wrote his columns as run-ups to the Thomas Cup, Francis and he got up close and personal Mohamad Ali during the Ali-Bugner world heavyweight fight in Kuala Lumpur when the duo would be there for the former’s morning runs at the horse racing course as early as 5am and Kevin Keegan whom he managed to secure to write a column when he was in Malaysia in 1982 to name a few. Tony also revealed that he loved horse racing and one day when Tan Sri Lee who was among the tipsters with NST was on leave, he was asked to give his forecast. But Tony said that wished that he did not have to lose his loved one, his wife and former journalist, Goh Keng Lee, so early in his life (1994). But Tony did well and his son Mark, 30 and daughter Kylie, 28, have graduated from Iowa and Harvard respectively and are working as professionals in Malaysia. Tony not only made a name for himself as sports journalist and as an editorial man, but has been a mentor for many young reporters including the scribe. He was a taskmaster who demanded the best, but it was his passion for sports journalism which rubbed off many of us and saw us strive to emulate him.